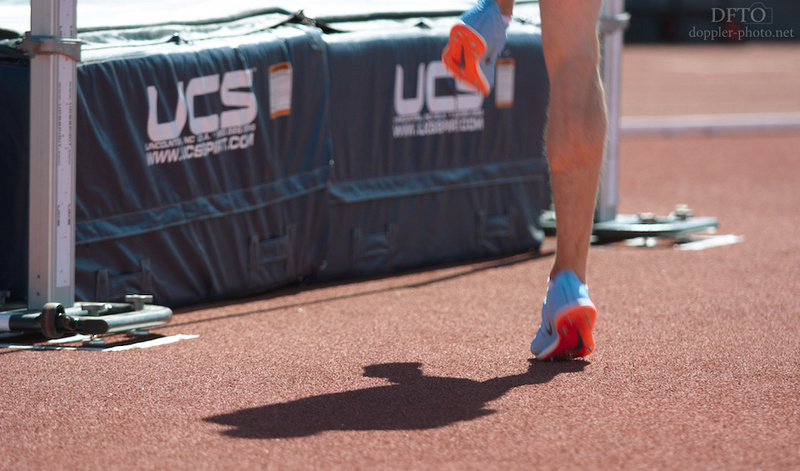 The high jump differs from all of the other jumping events in that the run-up is usually curved like a "J" — the approach starts with a straight section, followed by a curve. Different athletes may run from the right or left side of the apron. 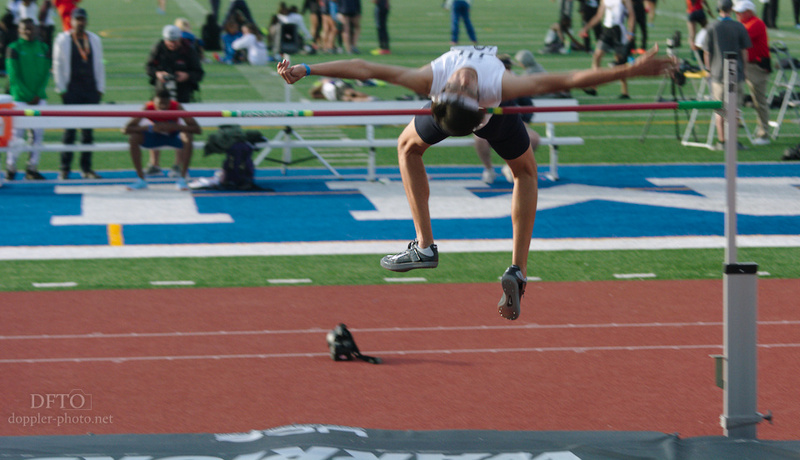 During the curve, high jumpers tend to place a strong emphasis on leaning away from the pit/crossbar, which creates a body posture that also differs dramatically from every other jumping event, where the focus is on running tall and maintaining an upright torso position. The body position ends up being fairly similar to the body position in the javelin throw. It's no coincidence, then, that after javelin, high jump is the only other field event that typically involves shoes with spikes on the heel. And in both cases, the reasoning is the same: the goal is to create an aggressive change of momentum, in a single step, that drastically reduces your forward velocity (converting it to upward velocity in the high jump, and implement velocity in the javelin). After the jump is where the jumping events part ways with the throws. You'll remember that the throws involve a recovery, to keep from crossing the limit line of the throwing area. But how well or poorly you recover doesn't have a direct impact on the distance of your throw. In the jumps, you work just as hard before the jump as you do during and afterward. 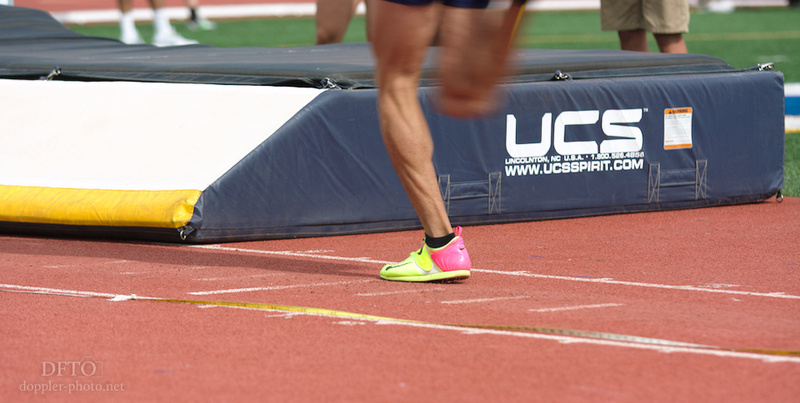 For instance, in the high jump, your legs don't just dangle — they allow you to control your body position in midair. 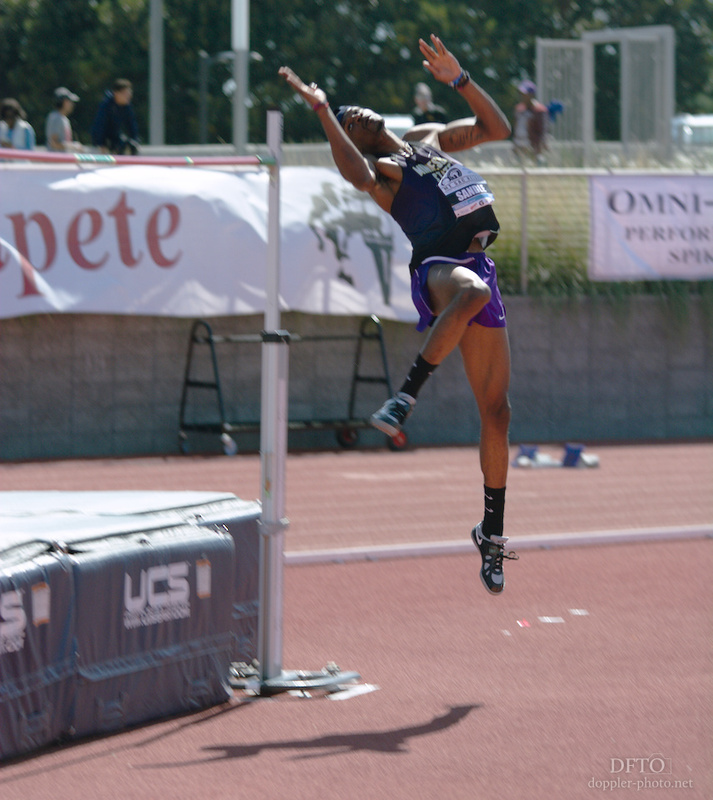 A lot of the best high jumpers can pass over the bar even though the center of mass of their body will pass under it, and careful timing and execution of leg movements is part of what allows that to happen. The pole vault is unique among the jumps in that it also involves an implement — the pole. 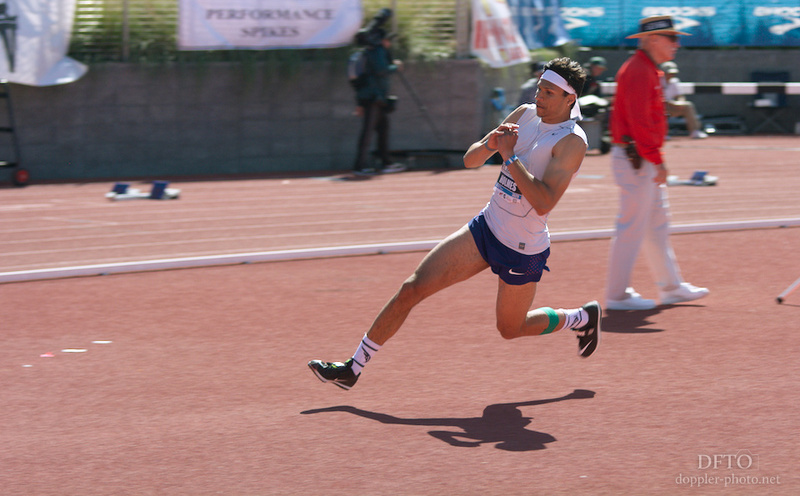 The run is fairly similar to a long jump or triple jump run (or the straight section of the high jump approach), except that the athlete has to run without swinging their arms, because they need to carry the pole. 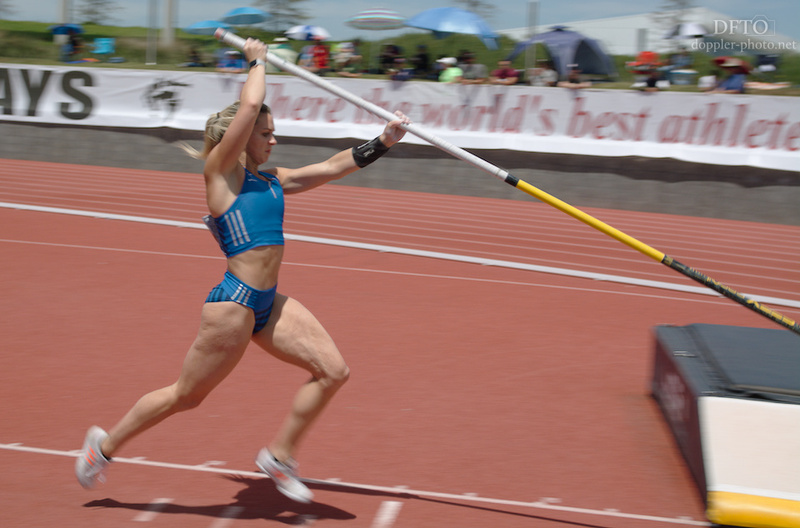 Some vaulters will slide the pole on the ground and pump their non-dominant arm as they run, but that technique is fairly uncommon. The footwork involved in the pole vault takeoff tends to be pretty straightforward — a lot more of the technique in that moment involves the arms and torso. That said, you'll note that the heel is already elevated here. 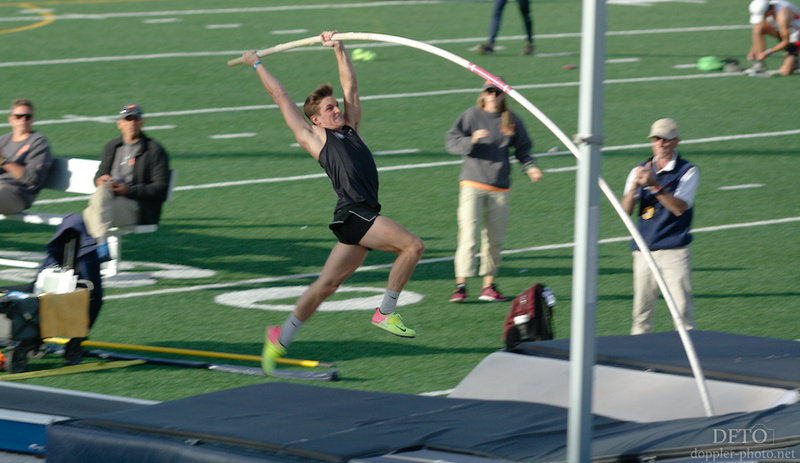 A good pole vaulter will tend to "run off" off the takeoff — they'll definitely jump off the ground, but the transition into the air will tend to be fairly smooth. And again, after the takeoff, there's still a lot of work to be done. As with the high jump, pole vaulters use their legs to control their momentum in midair. Actual vaulting techniques have a bunch of variations that differ pretty dramatically, which is too much to go into here, but as a general rule, the vaulter will keep their body fully extended to transfer energy into the vaulting pole, and then will pull in their legs to rotate quickly into the inverted position. You'll see a similar pattern show up in the horizontal jumps as well. Speaking of which, this post ran longer than expected, so tune in next time for the actual final post, on the long jump and triple jump. Click here to subscribe.